In today’s tutorial we’re going to show you how to style your vertical navigation links so that as a visitor scrolls down the page, the menu link corresponding to the section they’re in will highlight. It’s a nice little effect that adds a bit of interactivity between your web design and the user’s behavior. This method works particularly well if you’re creating a one-page website. For those having a hard time picturing this effect in their mind, we’ve provided a preview below. As you can see, the highlighted active link changes automatically as the user scrolls through the page sections (as well as on click). We found our inspiration for this post at the Filmschool Berlin website which we mentioned as an example in our post on vertical navigation. A reader in the comments of that post asked that we show them how to create the scrolling active link effect and so here we are! To pull this design off we’re going to begin by making use of the free and well-rated Page Scroll to ID plugin which you can find here. Click on the ‘Download’ button and save the plugin ZIP file somewhere where you can find it right away. 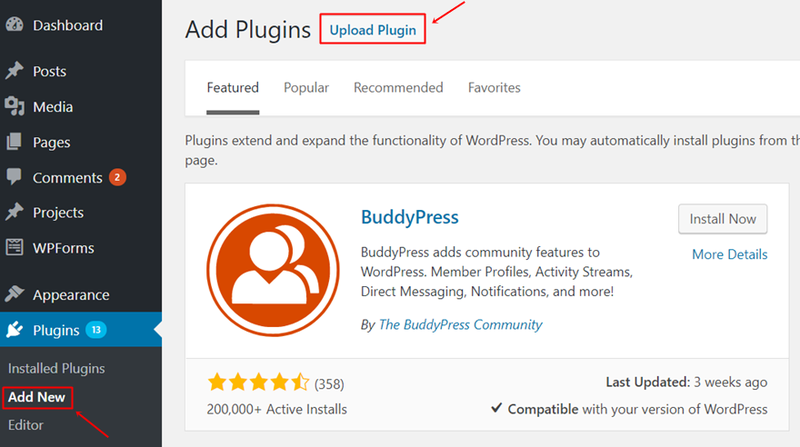 The next thing you’ll need to do is go to your WordPress Dashboard > Plugins > Add New > Select the ZIP file you’ve just downloaded and upload it. After that, don’t forget to activate the plugin as well. 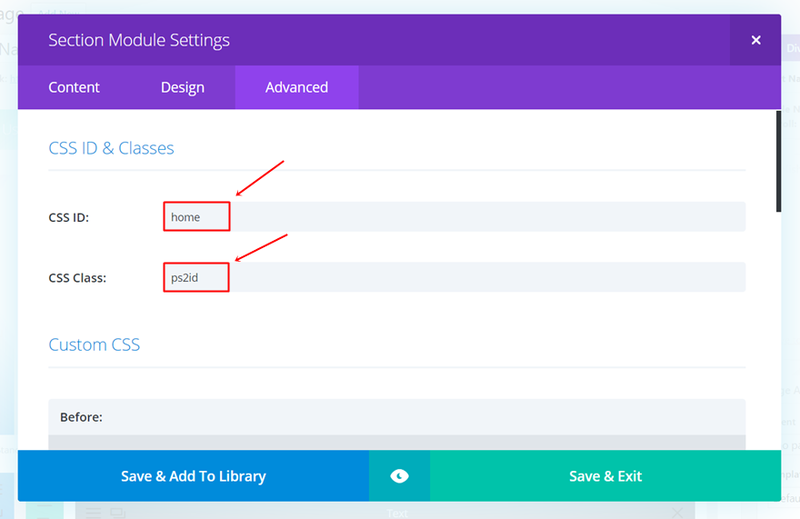 Before we get into the settings of the Page Scroll to ID plugin, we’ll enable the vertical navigation (and the fixed navigation in the next step) first. 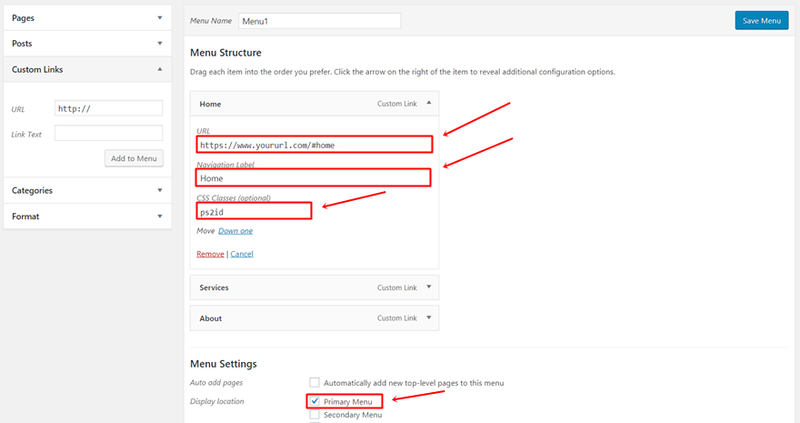 If you’re on your WordPress Dashboard, go to Appearance > Customize > Header & Navigation > Header Format > And enable vertical navigation. Moving on, let’s enable the fixed navigation of your website. This is necessary since the whole point of using the active links on scroll is for the visitors to see which section they are in, when they’re in it. 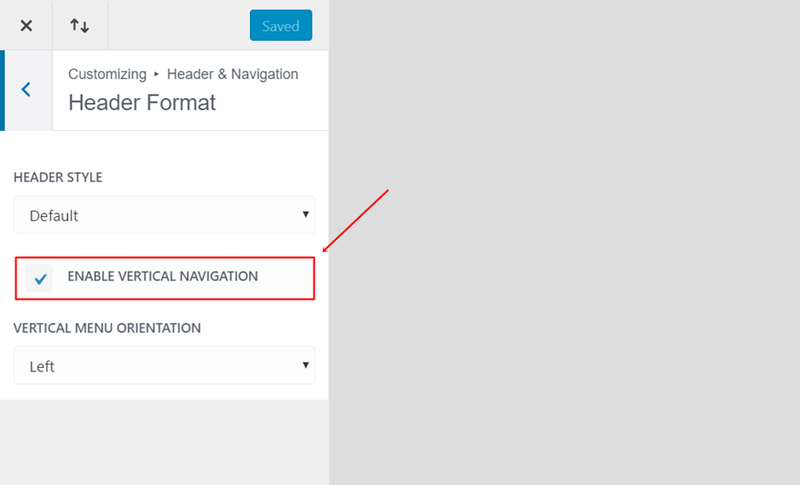 If you’re on your WordPress Dashboard, go to Divi > Theme Options > And enable the Fixed Navigation Bar in the General tab. For this part, we’re going to go back to the plugin that was recently uploaded. Once you’ve activated the plugin, you’ll need to use the right settings. To go to the settings, click on ‘settings’ right below the plugin name. The next thing you’ll need to do is assign the different CSS IDs and the Page Scroll on ID CSS Class to the different sections on your one-pager. To do that, open the settings of each one of your sections and go to the Advanced tab. 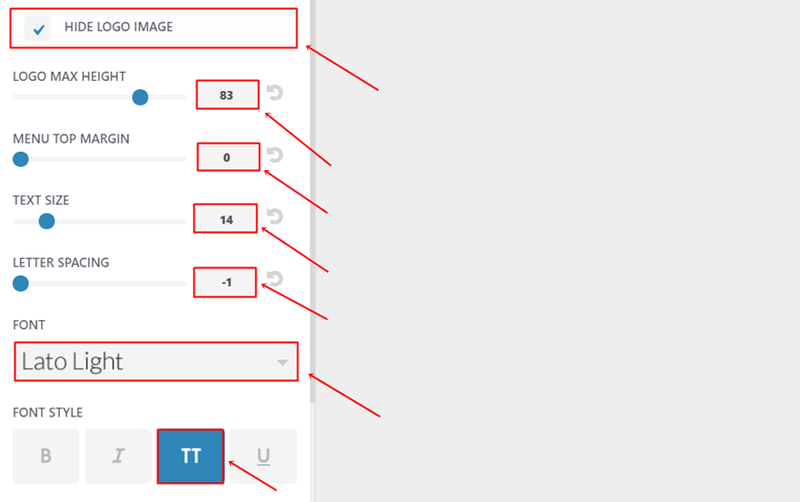 Within the Advanced tab, decide on the different CSS IDs you want to use for your sections. Know that, in order for it to work, you’ll have to assign a different CSS ID to each one of the sections on your one-pager. In this example, we’re using ‘home’ as our first CSS ID. The CSS Class, however, is the same for each one of the sections and helps you link the section to the Page Scroll to ID plugin. The CSS class name is ‘ps2id’. Next up, it’s time to create the menu items and make sure they’re in line with the sections and with the Page Scroll to ID plugin. 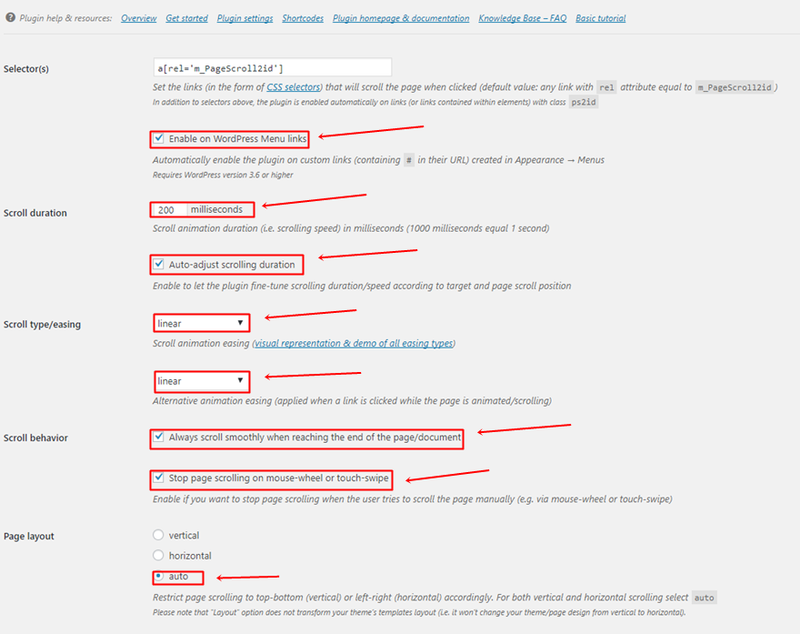 If you’re on your WordPress Dashboard, go to Appearance > Menus. If you already have a primary menu, you can work on that one. If not, you can type down the title and create a new menu. Don’t forget to make it a primary menu. Next, you’ll be needing custom links to achieve the results you want. Start by adding a first custom link. 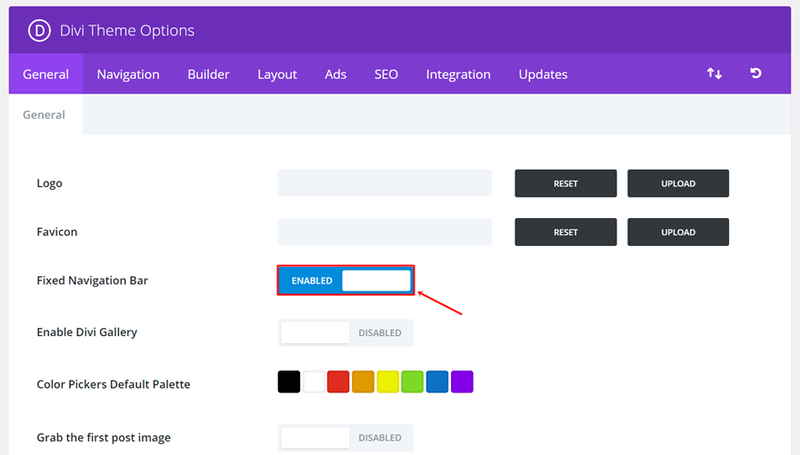 Add your website followed by the first section ID to the link field as shown in the screen shot below. The next thing you’ll need to do, if you haven’t done it in the past already, is activate the CSS classes for your menu items. To do that, click on the ‘Screen Options’ option in the right corner. Once the possibilities appear, enable the CSS classes. Once you’ve enabled the CSS classes for your menu items, you can go ahead and manually link the Page Scroll to ID class to each one of the menu items. The CSS class is the same as we’ve used to assign IDs to our sections, namely ‘ps2id’. You can make all kinds of modifications to your primary menu, even when you’re using this method. To show you how you can make the changes, we’re going to recreate our example vertical navigation. Note: As mentioned in the introduction of this post, you won’t be able to see the changes you’ve made while you’re previewing the page. You have to publish the page first and view it in its live modus to notice the results. You can, of course, modify the style to your own preferences (or use it for top navigation as well). In this tutorial, we’ve shown you how to create an interactive vertical navigation menu for one-pagers. We’ve shown you how you can use the Page Scroll to ID plugin in combination with the Divi theme to easily achieve the result you want to get. In a future post, we’ll come back to this and show you how to creatively style the active links you’re using through this method. If you have any questions or suggestions, make sure you leave a comment in the comment section below! I wish I saw this earlier this year. I just used anchor links in the menu items pointing to CSS IDs I created in each section. Can this be used to create a sticky secondondary menu? This would be possible even without using the Page Scroll to ID plugin, wouldn’t it? This is the topic, I asked your support team for half a year now. I never got an answer. Why could’nt you post it earlier, before I killed myself? I will try it out now. But does it also work on horizontal menu? >> Why could’nt you post it earlier, before I killed myself? >> But does it also work on horizontal menu? Thanks for the information! We’ve been trying to get this to work, and the scrolling is perfect, however cannot get it to highlight the correct section when manually scrolling the page. We’ve tried everything! Thanks a lot for another excellent tutorial, I love these in-depth tutorials where I can learn how to work with Divi. Really helpful and inspiring! I’ve just tried the vertical version, and the highlighting (even when manually scrolling) works perfectly well here, too. I wonder what is getting in your way there. I had the same problem with highlighting. I found that, in order to make the highlight apply to the correct menu item, each sections need to be long enough to fill the screen. Once I did this, the highlighting worked perfectly. 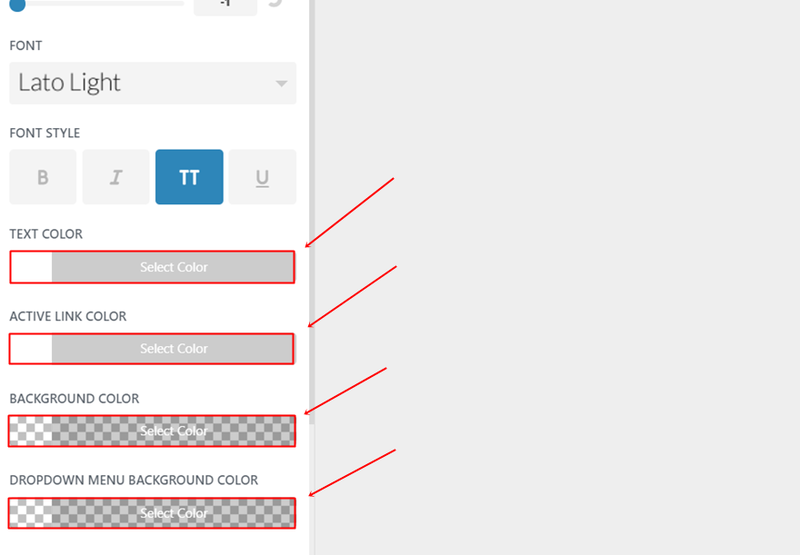 Hi, is there some code that I can put in the custom CSS section that does the following: I have a primary menu and a fixed navigation menu, what ends up happening now is that my fixed navigation menu turns all white(or any color that i set it to) and doesn’t highlight the current section. please help. 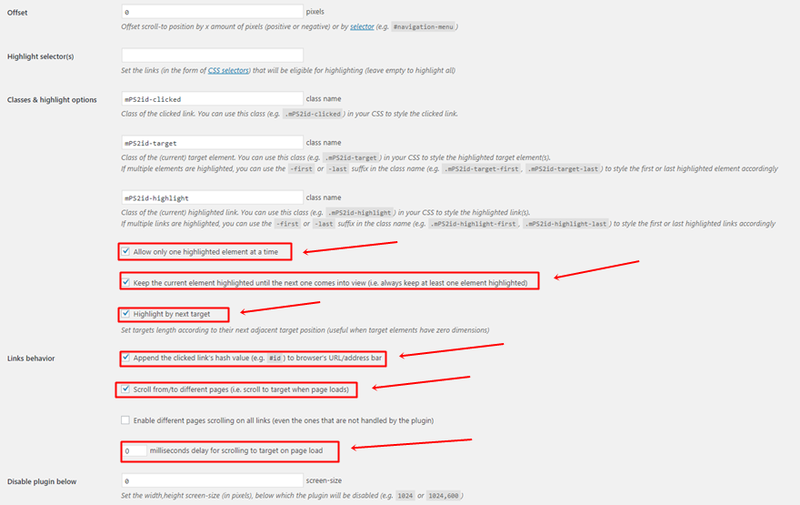 All links remain highlighted. I have only a primary and a secondary, but the primary is the one controlling the scrolling to anchors. 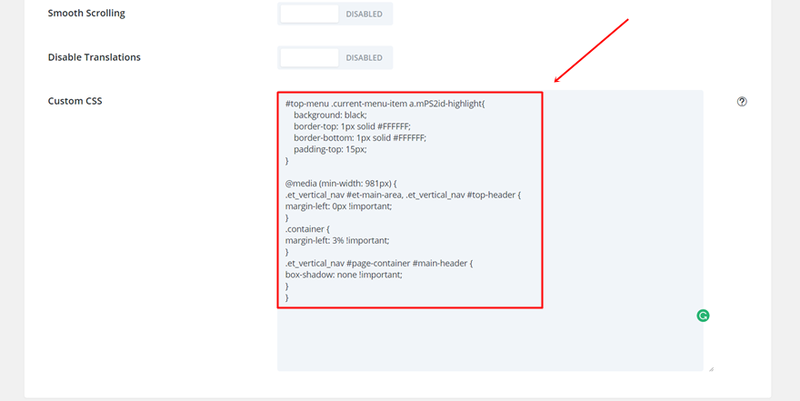 I have the ps2id on every one of the main section “divs” or boxes in Divi Visual Builder Tool. I followed tutorial very carefully but nav is not responding. Hi, for me it was very useful, tutorial gave me exactly, what I was looking for to customize my own website! Great help! Thanks a lot!